QUESTION: Many thanks again for the stream of clarifying observations posted daily — hugely appreciated. I was struck when reading that 2015.75 could be a low.Would this not permit a drop to cross 11,750? And would such a resulting chart pattern not be remarkably bullish? In effect might not the drop be an amplified echo of that into the Oct 2011 low of 10404 ? Continued strength to your elbow ! ANSWER: Typically the level of the market that defines the bull and bear market distinction is the Quarterly level in time. The Dow NEVER elected a single Quarterly Bearish Reversal from the 2000 high despite the 11 quarter decline into 2002. When we look at the 2007 high, we did elect the first Quarterly Bearish by the 3rd quarter 2008 at 10850. That resulted in the crash for the next two quarters signalling that would be a serious meltdown. 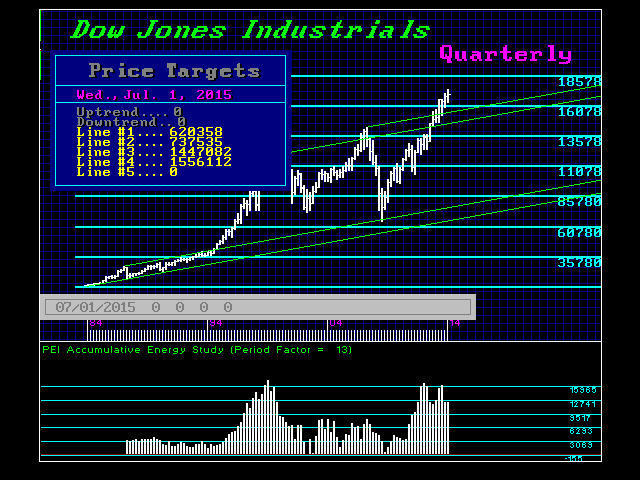 We elected the first Quarterly Bullish just 2 quarters later – 3rd quarter 2009 at 9712. The low in 2002 during the 4th quarter elected the first Bullish Reversal right there at the low. This potential correct could be the cycle inversion for the decline would be the shortest being just 3 quarters placing us in the 2nd quarter 2015. That does not line up perfectly with the ECM. However, that might produce the lowest closing with the 3rd quarter producing the intraday low. If we were to see such a low, then holding the 14470-15560 area at that time would be exceptionally bullish. Therefore, holding the 14700 level on a quarterly closing basis would keep the market tone very bullish. Only a Yearly Closing beneath 10600 would reverse the bull market. Therefore, even a decline into 2015.75 without a Quarterly Closing beneath 14700 would confirm the extension. We MUST realize that a collapse in confidence with government that is clearly underway in Europe, is the requirement for a cycle inversion. Under this scenario, everything will rise but government debt – that is corporate debt, shares, gold, and commodities as well as real estate. This is what happens in a meltdown of confidence that is brewing everywhere from Hong Kong to Italy.